Since, it is a quick movie review of Tubelight starring Salman Khan. Let's come to the point straight. Expectation from film is huge be it movie lovers or trade. Reason, simple being Salman delivering classics in Bajrangi Bhaijaan and Sultan in recent past. 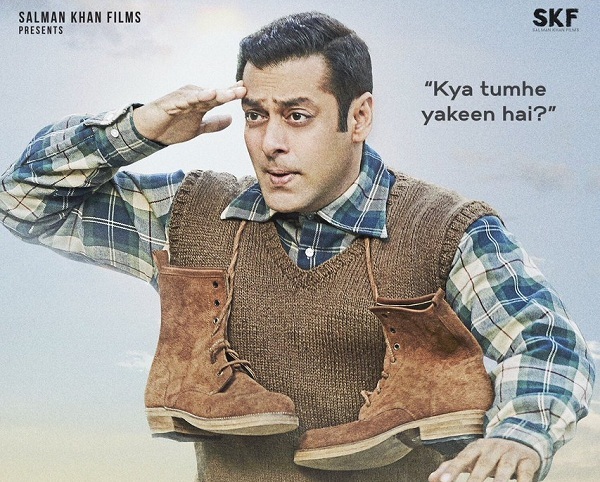 Will Tubelight live upto the expectations? Let's review it. Film storyline is simple. Laxman (Salman Khan) is a dumb boy/man who catches thing very slowly. He is thus nicknamed 'Tubelight'. Only his own younger brother Bharat (Sohail Khan) belief in his abilities. As Indo-China war arrives Bharat goes to war front as Nation calls for duty. Laxman wants his brother to return home as soon as possible as he simply can't live without him. Will he able to do that? What are the pain he goes through while Bharat is away from Laxman? This is the rest of the story. Tubelight main plotline is based to two important phrases which are even relevant today. One is of Mahatma Gandhi - "An eye for an eye only ends up making the whole world blind" and other one is "Faith can move mountains". Tubelight intention is good and damn correct. Film is message oriented. We need such kind of movies to enlighten and aware our society. But problem is film screenplay which is flat and makes the whole journey tiresome more so in second half. Only plusses are Salman Khan superb acting. Which is the saviour. He makes your eyes moist in few scenes. His innocence is still killing which is plenty in first half. Kudos to him for trying such different path than usual masala entertainer. He could have easily make a 'Masala Action Entertainer' at peak of his career and delivered another blockbuster. But he tried different. Kudos to him for that. Other than Salman performance rest all about Tubelight is ordinary. Surprisingly direction of Kabir Khan is weakest till date, yes it is weaker than Phantom also. Box Office - Film is releasing on EID festive. Hence, film should get benefit of that for sure. But it falls on 4th or 5th day. Means, by then word of mouth will be out in open. Whether Tubelight can take benefit of that or not, only time will tell. Apart from that there is simply no action in the movie. Even enterainment quotient is also minimal. Hence, film might not do well in mass dominated centers. Overall we think Tubelight will be one of the lowest Salman Khan grosser in recent times. Film will find it hard to touch 200 crore at box office.